The 2019 season rapidly approaches and the C1 Calendar is confirmed as follows. The first three events are now open for entries with the fourth opening this coming Sunday at 8pm. Visit the calendar page on our website here to fill in the entry forms. 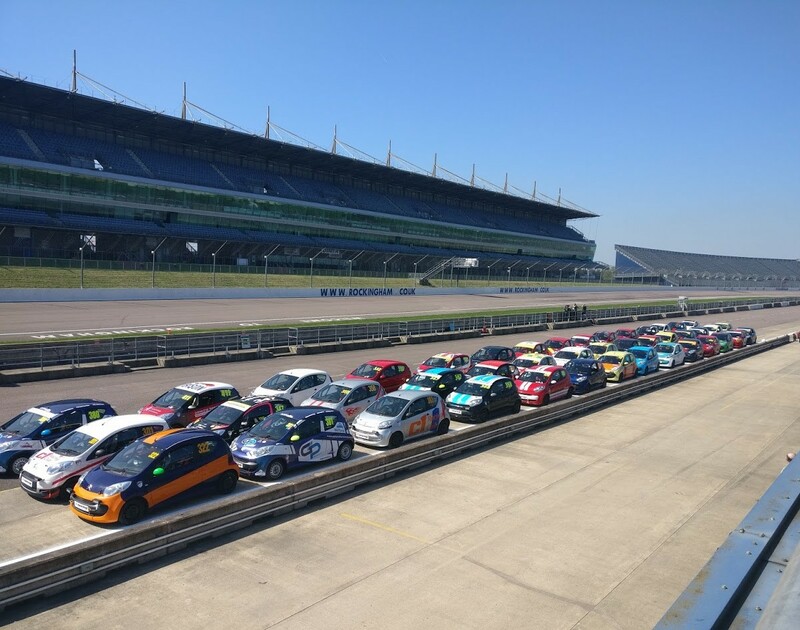 We did say mostly….. We were conscious, when we announced the provisional calendar, that the closure of Rockingham had taken quite a bit of track capacity out of the market, so we hadn’t got as much as we’d wanted. We’ve been working away at that with BARC, and have managed to secure three more race dates; and you can rest assured that we are working on getting hold of more for you. The updated calendar remains provisional for now. We’ll keep you posted. We will accord the deepest respect to anyone who manages all the races! The news that you’ve all been waiting for is at last here. Well mostly. The calendar remains provisional for now, but this is next year as we know it today. We don’t have prices yet and these are still a couple of weeks away, but at least this will allow you to put some dates in your diary. As soon as we have firm prices agreed with BARC, we will start to open the entries to the races using our time-honoured system on the website. We will email you a week before entries open and the forms become available, so you’ll have some notice. As per Silverstone 24hr, you will need to enter the drivers for your race entry to be valid; and those drivers will have to be members of the club. We’ll be distinctly impressed by anyone that manages to do all the races, especially as some of the international ones clash; but there’s enough to keep us all busy in 2019. We look forward to seeing you there. A reminder that entries will open on the C1 Racing Club website at 1700hrs on Sunday 28th October. For an entry to be valid, three drivers have to be named, all of whom must be current club members. If you have not joined yet, fear not, your Club membership will be valid for the 2019 season. The entry fee is £3,500 per team, which does not include any testing on the Friday. We are trying to negotiate the best deal that we can for the Friday for you, but the 24 hour event will start on track at 2030hrs with qualifying. We expect to have full video coverage of the event; and to have live streaming available. If you would like to have an in-car camera, please let us know at board@c1racing.club . Motorsports Days Live is at Silverstone on 2nd and 3rd November. We will be there both days in Absolute Alignment’s garage if you want to come along and have a chat. We’d love to see you there. Well that’s our official 2018 season over, although there are still a couple of chances to get your C1 out, most notably the simply wonderful Race of Remembrance run by Mission Motorsport at Anglesey on Remembrance Sunday, at which we will be running our somewhat battle-scarred car No 303 (reshell coming over the winter…). If you think you will be able to pass the breathalyser test, you may also want to consider Ben Atkinson’s “Plum Pudding” event on Boxing Day. If you think you may build a car – Let us know now!!! It is already clear from the various chat forums that a number of people are considering building a car. If you are planning to do so, you should order the club kit and cage no later than the end of November. The main issue is the cage, the lead time for which is already 12 weeks. So if you were to order a cage today, you wouldn’t get it until mid-January. This is Safety Devices’ busiest time of year, we have no influence over their lead times and we do not carry spare stock. If you are building, or thinking of building a car, especially for Silverstone, we would encourage you to get an order to us as soon as possible. 2019 season opener will be Silverstone! We’re going to start with the fabulous Silverstone GP 24-hour. We’ve tested at Silverstone, in the damp, and it was utterly fabulous. And, well, its Silverstone. Its what you asked for in the survey, so we took a brave pill or two and signed a big contract. We’re just working out the support races at the moment. The rest of the calendar is currently being nailed down. We will announce it as soon as we can. Entries will follow the same procedure as last year, with the race entries opening on the website with plenty of notice. Again, reflecting what you asked for in the survey, there are going to be a couple of sprint days and four or so enduros, hopefully with the season being rounded off with Spa again. Spa was fabulous, wasn’t it? Many congratulations to MacAttack who have had quite a season and rounded it up with a class win at Spa. It was a very well measured and confident drive after a spectacular qualifying lap from Simon Walker-Hansell, who managed to get a tow both up the Kemmel straight; and from Stavelot to Blanchimont. The MacAttack car also still sports the same bodywork that it started the season with; so it is possible! We all arrived at Spa in blazing sunshine, well except for Nick, who didn’t get in until nearly midnight. Having come from a decidedly chilly UK, it was lovely to feel the heat of the sun again. They have a slightly different approach at Spa, so its always a bit of a voyage of discovery as to what’s going to happen; and sure enough, the welcome packages weren’t as expected, but they were in a very large orange bag. We could learn things from them, we thought. Scrutineering proved to be a whole lot easier than last year, mostly because we had organized for an MSA scrutineer to be over in Spa with us, who was marvellous. Keith, thank you. So we all got stuck into practice. Well, two sessions of practice, unless you wanted to go and play with some very quick and awesome-sounding DGMC (a German category) series cars. That Mustang must rate as one of the angriest-sounding race cars in history. It went pretty well and looked stunning as well. Somehow, over the day, we managed to get all the cars weighed and scrutineered (or thereabouts). You really should attend the Spa driver’s briefing. It could only happen at Spa. Of course it started late; and of course it was in French. But we had Steve Sykes translating, which was just brilliant. The Clerk would speak loudly and enthusiastically for some time. Steve would then translate briefly and drily something like: “Respect the marshals, they’re there to keep you alive”. It was also the shortest drivers’ briefing in history; and failed to cover any of the material things that it would have been nice to know about, like full-course yellows or two safety cars. Not that any of us asked any questions of course. 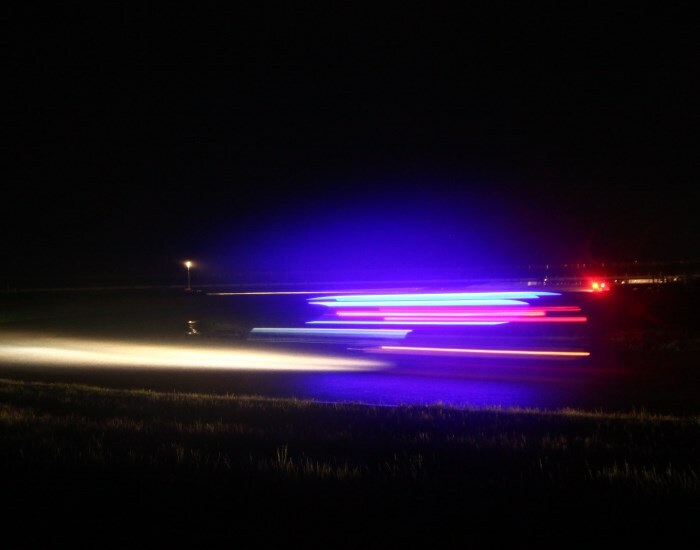 It is an FIA requirement for every driver to complete three laps of night qualifying in order to be able to drive in a 24-hour race. Not in Belgium, its not. Quali was one and a half hours, which is mighty tight when you have 6 drivers, and daylight only. Its even tighter if you forget (despite half a dozen text reminders) to have your car weighed. And its underweight. And the seat is out of date. You had to admire our American friends style of walking over to the reassuringly expensive shop and just buying another seat, though. We managed to get them out in quali. Just, with their car sporting some lead that was somehow (and somewhat worryingly) procured from a nuclear power station. Most of the rest of Saturday passed in a cacophony of noise from the BGDC, the standouts being that Mustang, a Mondeo which sounded like it had much the same engine and, of course, a brace of 911s. It would best be described as an eclectic bunch. The race proper started at 4.30pm… well, it should have done. More like 4.45pm and it took a while for the timing system to catch up. Obviously, the drivers’ briefing hadn’t covered the start procedure, so we had no idea what was going on, but it all worked in the end and off we all went! Atomic Racing turned a mistake into misfortune, somehow getting caught up in the wrong group and starting from the pitlane. They enjoyed leading the class for the first 5 laps until a safety car bunched things up again. There’s nothing like rain to shake things up at Spa; and boy did we get rain. Those lucky enough to be in the cars at the time could watch the thunderstorm coming up the valley towards the circuit until the deluge hit. At times, visibility was down to 25m or so. The rain stayed with us until the closing stages of the race, but dried out eventually. Stand out heroes? There’s a deep bench to chose from here, but mentions have to go to Hurricane, for giving their car to another team after an accident concussed one of their drivers – that is proper sporting behaviour and we love you for it chaps. To 416, our American friends who had never seen a C1 before; arriving at the circuit with six drivers and mostly-finished car. It even had a stick shift, but at least it was left hand drive. They beat all odds and finished the race. Gents, and lady, well done, and we look forward to having you back over here again soon. To Mission Motorsport, who brought two cars and fifteen injured veterans over, one of which finished, the other of which had an accident; and to all the team crews who repaired broken drive shafts (we ran out), body work, suspension arms and kept everyone on the road. We had some more wheels fail at Spa. All bar one of the failed wheels have now been given to Citroen to analyse, so we will come back with their report as and when we have it. The only additional news we have is that each wheel that failed appeared to have come from a different batch; and that most had clear kerb or accident damage to them. Safety comes first of course, so although we do have some options for different wheels that we could use, at this stage we don’t know whether they would be stronger, and they are a multiple of the cost of the current steel wheels. Our advice remains that if a rim is damaged – dispose of it. We are meeting shortly to agree what changes there will be, but we hope that you will be reassured to know that they are likely to be minimal and aimed at safety and keeping costs down. One will be the requirements will be to have an operating forward-facing video camera. This is a low-cost way of ensuring that the Clerk of the Course will have the evidence to investigate any contact; and support a continued improvement in driving standards. We’re going to be there again on the BARC stand for all four days. Come and see us for a catch up, to ask questions and look at cars. We will have a car on the stand for the children (young and old) to play with. Look forward to seeing you there. This has been an amazing first full season for us; so we would like to thank each and every one of you for making this possible. We hope that you’ve enjoyed it as much as we have, we feel somewhat humbled by what we’ve created, and of course if you’re receiving this newsletter you are part of that success, whether you are a driver, mechanic, car builder or interested reader! As always if you have any ideas on how we can improve things, drop us a mail at board@c1racing.club. We’re already excited about next year and look forward to racing with you all next season. We are ridiculously excited to announce that we have agreed with BARC and Silverstone that our first UK 2019 24-hour race will be held on the Silverstone GP circuit on the 26th, 27th and 28th April, 2019. That’s right: the same circuit that the Formula One race takes place on. With 110 C1s, which means two start groups. We are of course inviting our Belgian, Portuguese and Scottish friends to join us, but also expect teams from Germany, Hong Kong and the Unites States of America too. We have elected for the old Formula One garages, because they have more space, especially in the paddock behind the garages; they are next to the showers and other amenities; and because we just prefer the pit lane entry there. The entry fee is £3,500, payable 50% on booking; and 50% before 28th February, 2019. Entries will open, as usual on the C1 Racing Club website, at 1700hrs on Sunday 28th October. Please remember that to book, you and your drivers need to be current Club members. The balance of the 2019 season calendar will be announced shortly, once it has been finalized with BARC and the circuits; but rest assured that we have reflected what you all asked for in the survey. Excited? Its going to be a long winter. The A1M turned out to be as awful as anyone could possibly have feared, although closing one of the UK’s main north south arterial routes on a Friday and a Sunday was an interesting approach to road management. But wasn’t Croft wonderful when we got there? Cold too – maybe there is something in the phrase “the Frozen North”? We haven’t been up there for a couple of years, and Tracey (the new circuit manager) has really sorted the place out since then. Smart, nice new lavatory & shower block (better than at home, one person quipped) with lashings of hot water. Talking to Tracey, there’s a lot planned at Croft over the next year or two, with a new building, improvements to the entrances: we look forward to seeing it all. One of the key topics for the weekend turned out to be wheels. Or rather Wheel Failures. We had been planning a piece for this newsletter about lifing wheels; and how it is not a good idea to use the older wheels for racing. Typically, small nicks in the holes turn into stress fractures, which result in wholesale failure. You also find, if you turn a GoPro on the wheels, that the older wheels flex a lot more than new wheels, the welds and steel both fatigue over time, so the handling on older wheels isn’t as good, as well as the risk of failure going up dramatically. 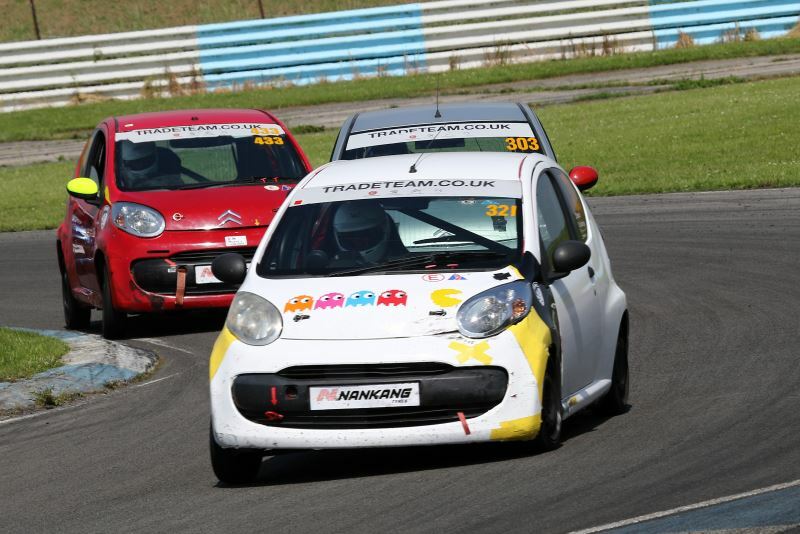 What was new at Croft was the failure of some new wheels, and failing through the body of the metal, not at the holes. All wheels that failed need to be sent back to Citroen for investigation; please can the owners of those wheels get them back to us and we can forward them on to Citroen; we will report back when Citroen do. A common feature to all three wheels was significant dents to the rims, suggesting heavy kerb usage. We can’t emphasize enough that using kerbs in endurance racing is a pretty sure-fire way to end your race early. Not just from a wheel damage perspective, but the shock loads that it also imposes on the suspension, drive shafts etc can all lead to premature failure. It may feel racey; and it may even be faster for a few laps, but its not good practice in longer enduros. What did you think? We were really pleased with the way that the four heats and final went. Driving standards were high overall, although track limit breaches were reported eighteen times by the marshals. The racing seemed to be good as well right up and down the field. We will be running a couple of sprint events next year: probably one on the same weekend as an enduro (as per Croft); and one on a separate weekend, so that we can all see how it works and how popular it is. You may not have noticed it, but for the first time this season, BARC supplied four track-based observers to report on track limits and driving standards. This will be standard practice next season, so that there is 100% consistency on reporting throughout the season and throughout each meeting. However hard we, as directors, try, we can’t be everywhere all the time, but we are determined to ensure that we maintain the highest level of driving standards possible in the series. We are delighted to announce that the decision to disqualify Car 414, Team Green Racing and Car 384, Area Motorsport has been overturned on appeal; and replaced with a fine. This is consistent with the penalty applied at the touring cars meeting at Knockhill the previous weekend and, in the Club’s view, the correct penalty under MSA regulations for a safety infringement. The final results are to be restated and published shortly. Our season finale is in less than a week now. It is, we realise, too close to Croft, and we will ensure next year that we don’t have races in such close proximity. It only came about this year because we had a date at Donington that was cancelled shortly before we announced the calendar for the season; and that was all we could get at that point. We will endeavour not to do that again. The final instructions and supplementary regulations for the wonderful season-closing race at Spa have been published and you can find them here; and we are hugely excited about it. For those of you who haven’t been before, wrap up warm, its always very cold at night there – we’ve had one year where it was minus ten degrees and we all carried on racing. It is a brilliant weekend and one we look forward to all year. It’s going to be one of the biggest grids ever at Spa, so we should see some pretty exciting racing. Look forward to seeing you out there. Rocky II and final 24hr turned out to be a decidedly interesting weekend, for some of the right reasons, and for some less so. Overall, the racing was some of the best that we have seen so far, and it was great to see some new teams out there. We were blessed with near perfect weather and the new track layout seemed to be preferred by almost everyone. We shall miss Rocky, it’s a great venue and the facilities were excellent for what C1 Racing needs. This is one on which everyone is going to have an opinion; and on which our ability to comment until the appeal process is completed is severely restricted. Two cars were disqualified from the 24-hour race; and one car from the 3-hour race as a result of having been found with their fire extinguisher pins being in when checked in parc fermé. Such a decision is inconsistent with the decision taken the previous weekend when one of the Touring Cars at Knockhill was found in the same state in a properly-policed parc fermé; but was only fined. Both competitors in the 24-hour are appealing this decision; and that appeal is fully-supported by the Club. We also understand that there is a further appeal pending. We are not able to comment further at this stage. Penalties turned out to be something of a feature of the weekend. Some took it in good humour, some less so. They are there for a reason, though. There is little point in having a set of regulations, if some people don’t abide by them; and some do. We have implemented fixed and written penalties, which escalate on repeat offenders, so that there is consistency between Clerks and circuits. Four directors run the club; and at each event, we try to have at least two of us acting as DSOs around the circuit at all times, much of the time, we have three of us. As far as we are aware, no other club goes to such lengths to ensure a level playing field and fair racing. For much of the 24-hour race, we had three of us acting as DSOs: one in the pit lane monitoring pit lane speeds; and two out around the circuit monitoring driving standards. Even in the early hours, there was always one of us acting as DSO out around the circuit or in the pit lane. At some of the corners we monitored, there was nothing to report: for example, monitoring Yentwood and Tarzan in the first two hours of the 24-hour race saw no accidents and no track limit transgressions; so we moved to a different place. Other corners, however, saw a significant number of material transgressions and so we focused on those points; we reported them to the Clerk of the Course, who in turn decided whether to apply a penalty or not. For the last 8 hours of the 24-hour race, it was clear that competitors were increasingly breaking track limits at the chicane in front of the pits. Even though we only reported the most egregious and repeated breaches, the frequency of breaches grew as the race progressed; to such an extent that a number of the rubber protection mats beyond the two blue and white kerbs were thrown around by cars; and had to be recovered by marshals during safety car periods. In total well over a dozen cars were reported for breaching track limits; including one that was reported three times over the course of the race; and three who were reported twice. We don’t want to have to do this; but it’s impossible to achieve a level playing field if some competitors don’t abide by the rules. A similar number of cars were reported for speeding in the pit lane at speeds ranging from 34 kph to 52 kph. Rocky is unusual in that it has hot and cold pit lanes, which are a hangover from its Indy car roots. The hot pit lane doesn’t work very well for endurance racing, so we negotiated with Rocky, the MSA and BARC to be able to use the cold pit lane for our races. The compromise was that we had to have, and to enforce, a 30 kph speed limit from the start of the pit lane (which was clearly marked with a white line and 30 signs at either end of it); to the end of the pit lane (which was clearly marked with a green light with an “end of 30” sign next to it). There were 8 repeater signs up the pit lane, which we installed and paid for. We covered this in both drivers’ briefings; and explained to any driver who was stopped for speeding in the pit lane (or team if we weren’t able to) what the limit was, why it was there and where it started and finished. We will be back to the usual 60 kph speed limit in the pit lane at all the other circuits we race at from now on. The ugly head of drinking reared itself again at Rocky II. The Club has a very clear zero-tolerance policy for any driver or team member who touches the car in the pit lane. We were somewhat hobbled at Rocky II, since the Club breathalyser announced on arrival that it wanted to be calibrated and although we searched, we could not find any disposable breathalyser tubes locally. We have solved this by buying a second breathalyser and will have them calibrated alternately every three months, so that at no point could we be left in this position again. We were alerted that members of a team were drinking during the race and so visited the garage. One driver had a bottle of beer in his hand, so we had a discussion with him and suggested that he handed his HuTag in. No one else in the garage was drinking at that point. We then reported the matter to the Clerk of the Course, who immediately sent the pit lane chief to that garage and removed the HuTag from that driver. Both we and the pit lane marshals visited that garage on a regular basis following this breach, but at no point after that was a driver or team member seen drinking; nor were we presented with any other evidence to that effect. We have now published the Club Rules, which set out the Club policy on alcohol & drugs on the C1 Racing website. The penalty for any driver or team member’s drinking is that the team is excluded from the event; however, the Clerk was unable to impose that, as we did not have a functional breathalyser. Rest assured that with two operating breathalysers, we will never be in that position again; and we will be breathalysing drivers before they get in the car as well. It is also worth noting that a refusal to take a breathalyser test is treated as a failure. Thank you all for your efforts on the weighing front. Although it takes time, the purpose of weighing and tagging all the cars is so that lighter drivers do not have an advantage. No system is perfect, since teams with some light and some heavy drivers will have a disadvantage over teams with drivers all about the same weight. It is, however, in our view, the fairest system. From next season, we will be introducing different coloured tags at each race; and your car will not be able to pass scrutineering without the correct-coloured tag lock-wired to the car. We also intend to introduce Club ballast plates, which will have lock-wire holes pre-cut in them, which should make the process easier for those who want to use them. There have been some comments on the forums about the Club’s running its own cars. We do this for a number of reasons. Firstly, we need to test any components that we are going to introduce in full race conditions so as to ensure that they perform properly; secondly, we need to have seats available for the press (at Rocky II we had Stefan Mackley from Autosport in our car); thirdly, we are much more able to scrutineer from a technical perspective by running our own cars and understanding the cars better; and finally, it gives us a much better perspective on driving standards than we would get from solely standing by the side of the circuit. It is commonplace for Series organisers to run cars in their own series, and we intend to continue so to do; and for the directors to continue to drive on occasion. We set this series up so that we are able to race in the way in which we wanted to; in a not-for-profit company, from which we are unable to pay ourselves. However, if you have serious concerns about the Club cars, please write to our chairman, Meyrick on meyrick@c1racing.club setting out in detail what your concerns are. On a lighter note, we are all looking forward to Croft. Not only do we have a full grid for the enduro on Sunday, we are also trying out the sprint format on the Saturday; and we can’t wait to see how it goes. There will be a further newsletter with the administrative points for Croft nearer the event. Over 130 of you would like to do sprints, marginally more on a different, rather than the same, weekend. A clear majority wanted heats and finals of a 20-minute duration, so that’s what we’ll trial next season. The five most popular circuits for sprints are Donington, Brands Hatch, Snetterton, Silverstone, Oulton; and the least popular five are: Knockhill, Pembrey, Anglesey, Thruxton and Croft. The most popular programme is for 4 enduros, so we will continue with that. The five most popular circuits for enduros are: Donington (by a clear margin), Silverstone, Snetterton, Oulton and Brands. Least popular are Knockhill, Pembrey, Mallory, Anglesey and Thruxton. Cadwell is no longer really feasible given the poor facilities and pit area there. We had to love the 23 people who would enter as may 24-hour races as we put on, but over 110 would enter one 24hr; and over 50 would enter two 24 hours. There was a mild preference for exclusive testing; about half wanted the costs included, half were happy to pay more for it. There was no stand out month in which you wanted 24hrs to be held; although a small majority would prefer it on a bank holiday weekend to not. The most popular three circuits were Silverstone, Snetterton and Anglesey, with Knockhill and Mondello at the bottom. In practice, we are going to have to be driven by the facilities that are available at each circuit to some extent. Thank you again for filling it in; it really will make a difference to what we put on next season. This is the latest information for the upcoming race meeting at Rockingham Raceway next weekend. You have probably already heard the sad news that Rockingham has been sold; and that the new owners do not intend to operate it as a race track. RIP Rocky – it’s a circuit that we’ve certainly enjoyed racing and testing at; and it feels like quite a loss to us, given the quality of the facilities there. 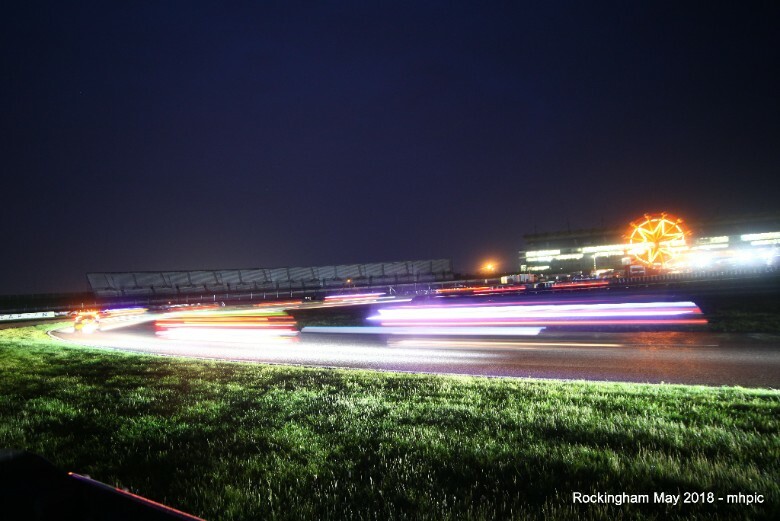 This means that our second Rocky 24hr is likely to be the last ever 24hr race at Rockingham. This newsletter is mostly on the upcoming 24hr and 3hr races. Rocky 24hr – would you like to drive the safety car? As something of an experiment, we offered a chance for people to drive the safety car in Rocky I. It all went swimmingly well; and we had so many volunteers that instead of the 8 that we asked for, the 20 or so people who volunteered all seemed to enjoy the experience; so we are going to do it again! As per last time, neither previous experience, nor a race licence is needed, although you do need a normal road licence; all you would have to do is follow the instructions of the marshal in the car with you. As usual, it’s going to be first-come, first-served. Please email meyrick@c1racing.club to volunteer. BARC have now published the full weekend timetable, which can be found here. We will not have access to the paddock until 1900hrs on Thursday night; and need to clear the paddock completely by 1000hrs Monday morning. Rockingham has very kindly agreed to open the Diner on Monday morning so you can have a bacon buttie to speed you on your way. We are going to repeat the group photograph of all the C1 Race Cars at the weekend. This will take place immediately after the warm up for the 24hr race: please would the 3hr cars line up in the hot pitlane during the 24hr warm up; we will then guide all the 24hr cars to join them, rather than going back to the pits; and hopefully it will be as bright and sunny as on the test day for the photographs. We will take pictures, first with and then without drivers (although one driver should get in the car, so as to be able to move the cars promptly once we’ve finished, so we would be grateful if all drivers (both 3hr and 24hr) could be in their race suits with their helmets for the photo shoot. We will aim to clear all the cars from the hot pitlane by 1110hrs, so that it is clear again for the SEC Tin Tops race, which starts at 1120hrs. It’s going to be tight, so please all be there on time. Club headquarters will be in garages 35 and 36 for the entire weekend. Membership cards will be available from Club HQ on Thursday evening: you will need them to sign on for the test day, and for the race weekend. Club HQ is also where breathalysing and Club signing-on will be; you should already have a HuTag, which you will need to bring with you, those that do not have one will need to purchase one (£10) from the Club. HuTags need to be worn on the right wrist all weekend. Teams will also need to collect and pay for their pitlane bibs (£40) from Club HQ. BARC signing on will be in Race Administration (within the school building at the rear of the inner paddock). At least one driver in every car (not team) needs to be a member of BARC, so please ensure that you have joined before the day. The Clerk of the Course will be in Race Control, which is located on Level 2, Stairwell 6; which can be accessed from the paddock via the tunnel next to garage 36, there is a lift next to the Diner; although we hope none of you will be summoned to visit. There will be separate drivers’ briefings for the 3hr and the 24hr, which will take place immediately after qualifying in the scrutineering suite for the 3-hour; and in the Rockingham Welcome Centre at 1530hrs for the 24hr on Saturday. The first part will be for all drivers and team managers in both the 3hr and 24hr races; the second will be for those drivers that are starting both the 3hr and 24hr races and will follow immediately after the first briefing. Entrance to and exit from the briefings will be recorded by means of the HuTags, so there will be no getting out of attending the briefings. If a team manager does not attend, the team’s drivers will not be allowed on circuit; if a driver does not attend, they will not be allowed on circuit. There will be a different procedure for weighing this weekend. We will shortly publish a timetable setting out half hour time slots during which you have to present your car for weighing. Please present your car full of fuel with all the drivers (in their kit with helmets and HANS devices) present, so that we can manage this efficiently. Please also ensure that, if your car has not already got a yellow weight tag, the drilled bolt is oriented with the hole at the top, and ideally in the rear outer corner of the ballast tray. Each car will be allowed a test and a check weigh only, so you will need to bring with you any ballast that you need, as the club does not supply it. Penalties & Pitlane Speed limit – stick to it! There will again be a pitlane speed limit of 30 kph, which corresponds to a little under 4,000rpm in first gear, and will be rigorously enforced with the Club’s radar gun. For those of you who haven’t read the Club’s fixed penalties, they can be found here. There is a new penalty for drivers who do not stop and register their HuTag on the exit of the pit lane. This is so as to ensure that teams with 4 drivers are not at a disadvantage to those with fewer drivers. All team members on the pit wall will have to wear a C1 Racing Club high visibility bib at all times, four of which will be available for each car. No pit wall shelters will be allowed, as it would hinder the visibility of teams further down the pit lane; nor may any pit boards be attached to the pit wall. LED pit boards are not allowed. A brief reminder on car numbers: all 24hr cars must display reflective race numbers as required by Section Q 11.4 of the MSA Yearbook. Touring car style and high visibility race numbers are not permitted. The 3hr teams will not have a pit allocation, unless their team is also running cars in the 24hr race. They will be based in the outer paddock, along with the SEC Tin Tops and Modified Saloons teams; and will only be able to bring fuel, tyres and a working tool box to the pit lane. We suggest that the remaining 3hr teams pair up with a 24hr team, to be located in front of their garage. We would be very grateful if those 24hr teams would help out those 3hr teams with tools and by providing some space if possible. Finally, please make sure that you have read the SSRs for the 24hr race, which will be published on the BARC website shortly, and any other bulletins that come out. All the Club directors have been published as DSOs and Judges of Fact for the event; and you will see us, especially at the first corner, sporting our identifying pink DSO bibs. We will be arriving on the Thursday night and will be staying at Rockingham for the whole weekend, so please come and join us for a drink the night before – although bear in mind that the club breathalyzer will be in action again for drivers, pit crew and team managers throughout the weekend. See you then. 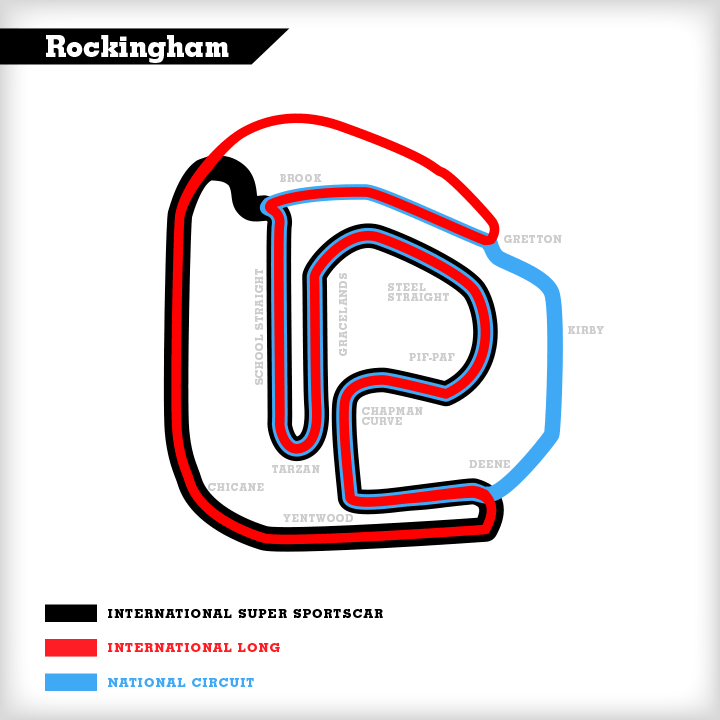 Following a significant level of comments from you all, we have been working with Rockingham, BARC and the MSA to be able to use the International Circuit at the second Rocky. 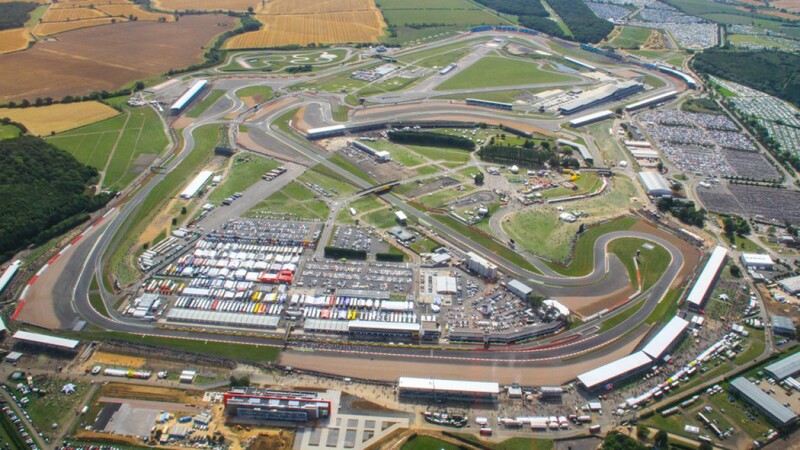 We have now secured all the consents that we need to be able to do that, and are delighted to announce that we will be running that slightly longer layout, which incorporates Gretton, Turn 4 of the oval, and puts a chicane in Turn 1; but eliminates the rather fiddly chicane at Brook and the pit entrance. To help you all get used to it, the Test Day at Rockingham on 16th August will also run this layout. We have some spaces left and at £195 for the day it’s great value, whether or not you are planning on doing the 24-hour. We can run it under a mix of track / test day regulations, with overtaking wherever you like, ability to time using the in-car timers, but no pit boards. This will allow drivers without a race licence to take part; and allow you to take passengers with you. We know that the test day at Snetterton was not what everyone hoped for, but this one is much more under our control; and we can pretty much guarantee that you will get a lot of track time. Come and join us, there’s the usual friendly Club welcome with a BBQ at lunchtime for everyone. We look forward to seeing you there. We will have both our cars out testing some tyre variants for wear, entertainment and grip, and we’ll let you know afterwards how we get on. There is some really exciting news about our Croft race meeting in September. We’ve been offered some more track time and thought we’d try some sprint races. Our main 5hr endurance race will be on Sunday, with qualifying on Saturday. We’ve been offered 5 x 20 minute races on Saturday afternoon for £300. The format will be 4 races and a final. This will give those in 2 driver teams a chance to race in 2 sprints each, those in 4 driver teams a race each and those teams with 3 drivers will have to draw lots, but at least everyone gets a sprint race. One driver could do all 4 sprints and the final themselves. The final will be driven by the fastest driver in each team. These races are optional and will not affect grid positions in the 5hr race. There is still some planning to do, but this is fantastic value racing. The entry form is now live and you will find it here. Places will be issued on a first come first served basis as there will only be 40 cars allowed to start (instead of 54 for the 5hr race) due to each race duration being less that 2 hrs. If you’ve recently (in the last 3 weeks) joined the club or renewed your membership and will be racing at Snetterton, you will be able to collect your membership card from garage 1 on Friday from 6pm and on Saturday morning at BARC signing on. You won’t be able to sign-on if you don’t have your club membership card or race licence. If you haven’t raced this year, you’ll need to collect and pay for (£10) your HuTag. These will be available from garage 1 from 6pm on Friday evening. You’ll be able to find the club directors in garage 1 from about 5pm on Friday afternoon until 7pm on Saturday. We will be scrutineering Tuff Jugs this weekend, so you’ll need to bring 2 Tuff Jugs with each car to the scrutineering bay on Saturday morning. If you have black vents in your Jug, they must be replaced by white blanking plugs. These will be available free of charge from the club. If you have white blanking plugs that have been modified so they let air into the Jug, they must be replaced by new unmodified blanking plugs that will be charged at £5 each. All Tuff Jugs will have scrutineer seals applied and these are the only Jugs that may be used for refuelling. We’re looking forward to seeing you all again at Snetterton this coming weekend. If you’re new to the club, come and say hello in garage 1. Another weekend of red hot racing! I didn’t expect to come from Dubai with pale skin and return with healthy tan (well.. sunburn really) but that’s what happened last weekend. Fortunately for all, the Mother of all Marquees (MOAM) was used as sunshade rather than monsoon refuge. Will the Race of Remembrance at Anglesey be so kind in November? Congratulations to McAttack Racing (347) on their win in the 5hr race on Saturday, completing 197 laps in total. In the end a 24 second lead over the battle-scarred Old Hat Motorsport (321) car sealed McAttack’s victory and their superb best lap of 1.25.452 was also the fastest in the race, although a little shy of their own staggering pole position time of 1:25.015 in qualifying. Third place went to Kraken Motorsport (411) who were another 47 seconds behind the Old Hats. Once again a combination of consistent speed, lack of contact, efficient pit work and cunning strategy paid dividends. Special mention must go to the Bengineering (309) team: after curiously claiming the circuit was boring after qualifying they went on to take a very respectable 4th place, beating a number of teams with much shinier race support vehicles. The 2hr race on Sunday was a similarly close affair, with just 19 seconds covering the first 3 finishers. Victory went to Old Hat Motorsport (321) completing 80 laps in total and with an impressive fastest lap of 1.25.902 Second went to the snappily-titled “Gala Performance With Amigo Motorsport” (380) team just 15 seconds behind, and third to the Absolute Alignment (346) car driven faultlessly by C1 Racing pioneer Chris Dear. Just outside the Top 3 was Ben Atkinson in the Bengineered Bengineering (309) car. All in all a really fun weekend of tight racing and yet again we saw evidence of the inherent fun and reliability of the C1 platform. Cars were driven flat out in hot and harsh conditions, yet we counted just two mechanical failures during the seven hours of racing. A driveshaft and a buzzed engine, but we can hardly blame the engine for protesting at being over-revved on a downshift. 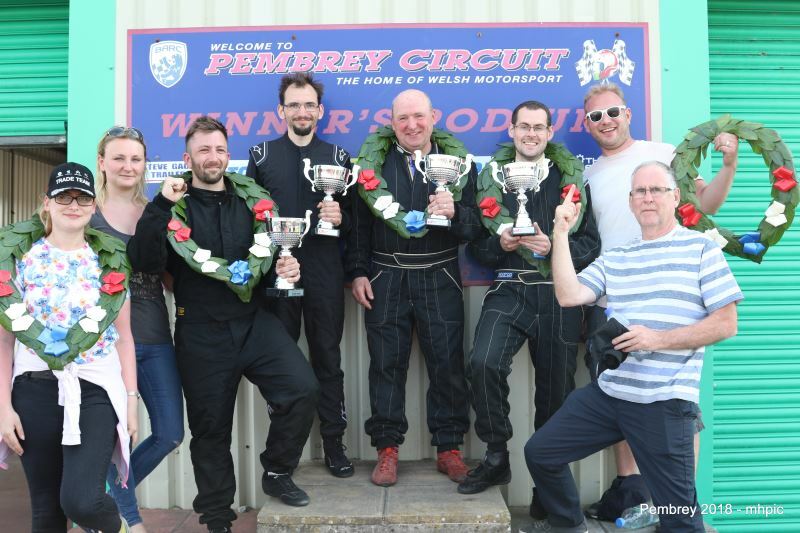 The Club felt that driving standards were much better in the 5hr race at Pembrey, and better still at the 2hr race on the Sunday… Had the naughty drivers gone home, or had you noticed that track limits and contact were being spotted by the pink-clad DSOs and being reported? Whatever the reason, we’re happy to see an improvement – it will be good for the club longer term, and of course will keep your costs down. The directors will continue to be involved in the racing to watch developments and retain a frame of reference for the feedback that we receive from other drivers. We believe this is important. One thing everyone MUST do is read the driving standards policy here. Some of you have confessed to NOT having read the document. You cannot win if you don’t know what the rules are. The DSOs noted hundreds of track limit violations and reported tens of the them. This resulted in a number of driver cautions, black flags and drive-through penalties. The feedback from the director participating in the race was that driving standards were broadly excellent. There was not excessive blocking, and contact seemed largely due to mistakes and/or running out of talent rather than mal-intent. Over the course of the year, as drivers gain endurance racing experience, we’re sure that the contact will continue to improve. We’re still a bit puzzled as to why there are drivers telling us about bad driving and not being able to provide evidence. Get a camera in the car then we can follow-up on examples of deliberate or incompetent contact! Any post-race comments on driving standards please drop a line to us at board@c1racing.club with the subject line “driving standards”. As well as the general car observations over the weekend, we checked a number of things on the first three cars and others at random. Plugs, filters, ride heights, camber, tyres brake pads were all checked this time around. Different things will be checked each time and we are conscious that we want to check a number of items on engines, gearboxes and ECUs. Any cars found not to have adhered to the technical regulations will be subject to the procedures that we have published. If it is particularly egregious we will issue a public censure of the team. At Pembrey all the cars were found to be within the regulatiion and no formal advisory notices were issued. We have come up with some clever ways to check internals and other more subtle cheats, so don’t be tempted. You have been warned. We must apologise for the HuTag failure at the 5 hour at Pembrey. Seemingly no amount of running around, extension cabling or number of wifi repeaters could make the system work reliably on Saturday. We felt particularly bad having asked you all to cough up to buy the tags. We had a new set of technical issues that weren’t present either on the Friday test day or when testing with dummy tags. The system was working again on Sunday but we decided to implement a hard copy back up just in case of a new glitch, given the issues of the previous day this seemed to be the prudent approach. The TSL guys at the circuit and back at base worked hard to provide a solution that was then proven to work during the Sunday race. We believe TSL has sorted the issue now so please bear with us. The longer-term benefits to getting this right are pretty obvious: no messing around with driver change forms (which is better for the crew and drivers) and easier identification of the driver in the car (which is better for everyone, particularly the fans who want to be able to follow their friends or favourite VIP drivers). In future, please be prepared to take direction from the marshals manning the exit lights, and importantly, be aware that the HuTag exit light is NOT the same as the pit lane exit light. The latter must be obeyed in all circumstances. Sadly one experienced driver innocently fell foul of this at Pembrey and received an 20 second penalty as a consequence. In future we will increase the physical separation between HuTag lights and end of pit lane to help avoid a similar situation. Do you want to party? It doesn’t seem like many of the C1 Club members need much help pulling together an impromptu party, but would you like the Club to organise an end-of-season / Christmas party? We have a pretty diverse mix of people, but perhaps some manner of dinner dance would work, and would give us the opportunity to hand out prizes. We note that some of you are keen to identify a 2018 C1 Challenge winner. While the rules around being a Challenge stop the Club from crowning a winner, we cannot stop the regular members of the “Unofficial C1 Racing Drivers and Fans” Facebook page identifying the same. Drop your thoughts to board@c1racing.club, with the subject line “2018 end of season party”. Looking forward to seeing you all at Snetterton on the 4th August. We’ve almost finished our packing for Pembrey and got the transport ready for the journey half way to America; so thought that we should share a couple of administrative points before heading out, since Pembrey have put in quite a bit of effort to make sure that we all have a great time out there. Although we won’t have pit garages, we will have a MOAM (the Mother Of All Marquees, which is a bit like a MOAB, but less dangerous). A 90m by 6m marquee has been erected to the left of race control (looking at the track); and we also have all the space to the right as well. So, if you have an Easy-Up (or Never-Up as our old one tended to be) then we will pop you to the right of Race Control; if you don’t we will allocate you a 3m space per car in the MOAM. The perceptive among you will spot that means that there are 30 spaces in the MOAM, so hopefully, enough people will have Easy-Ups…..
Campers will have a separate dedicated parking area with hook ups for electricity. Pembrey have shipped in a nice big quiet generator for us, so that we can create the usual spider’s web of cables and splitters around the camper area for the unwary to trip up on; and the rain to fuse. Seriously though, we’ve made a big effort with Pembrey to make your stay better. Fuel. Pembrey’s facilities are legendary, but a fuel station is not among them. The good news is that means you can use fuel that doesn’t cost more than Chanel No 5; the bad news is that you have to get it yourself. Happily, there is a nearbye Tesco at Parc Trostre, Llanelli, SA14 9UY, which is on the way to Pembrey; and yes, it does stock Momentum 99 Octane fuel, so guess what everyone is going to be running. Its still cheaper than Chanel No 5 too. Without wishing to be a kill joy, having random containers of fuel around the paddock as someone sparks up a post dinner cigarette is not a good idea; so there is a fuel dump where jerry cans of fuel have to be stored. You will need to label your jerry cans with the number of your car, so that you can get them back again. Overall, you are likely to need 75 litres or so for the 5-hour race; and about 30 litres for the 2-hour if you are doing it as well. Remember that there is no way to cross the track once the race is in progress, so bring plenty of food and drink (non-alcoholic for participants during the day…) in with you, since you will not be able to get out during the sessions, nor leave the circuit at the end until the racing is over. Bear in mind that, although signing on and scrutineering starts bright and early on Saturday morning, we still have nearly 50 cars to get through, so expect it to take some time. Please present your car with all drivers in kit (with helmet and HANS), full of fuel, with its C1 Club passport and MoT and with the drilled bolts in the right place for the lock wires. You will be allowed a maximum of 2 weighs on the shiny new wireless scales; and if you aren’t sure about your car, please bring plenty of ballast with you, since the weight limit requires ballast in pretty much all cases. Bear in mind that the winner of the 24-hour was 16kg over the minimum limit, so it can’t be that critical. We’ve now had a debrief meeting with Rockingham and are meeting BARC later this week to review how the 24hr weekend all went; we’ve also had some feedback from members on the weekend, although precious little. Thank you to those who have given us feedback, but surely more of you must have views on driving standards, admin, facilities and so on? Please – tell us what you think on how we can make the weekend better both on and off track? Pembrey, and the trip down the M4 half way to the United States of America-land, is already looming large. We have a full grid for the 5hr race on the Saturday. BARC have also just made some track time available for us on the Sunday, so we took that like a shot – if you’ve made the pilgrimage all the way down the M4 to Pembrey, you might as well do two races rather than one; another 2hrs racing and 50 minutes qualifying for £200 is great value in anyone’s book. Bear in mind that, although signing on and scrutineering starts bright and early on Saturday morning, we still have nearly 50 cars to get through, so expect it to take some time. Please present your car with all drivers in kit (with helmet and HANS), full of fuel, with its C1 Club passport and MoT and with the drilled bolts in the right place for the lock wires. You will be allowed a maximum of 2 weighs on the shiny new wireless scales; and if you aren’t sure about your car, please bring plenty of ballast with you, since the weight limit requires ballast in pretty much all cases. As usual, in addition to our shiny new wireless scales, our trusty Breathalyser will be in action again. If you’re crew chief, pit lane crew or a driver wearing your HuTag, please remember that we have a zero tolerance for alcohol. To cut down on race day admin we have re- programmed the HuTags with your club membership number; and rather than paying a £10 deposit and returning them, you will now purchase them from us for £10 at your first race (or when you join as a member). It will then be your responsibility to bring it to every race to have it fitted at Signing on. Without your tag you will not be able to get out onto the circuit. No more collecting, returning, deposits etc etc. Driving standards remain in our focus, since there was still too much panel damage at Rocky. We will be testing some low-cost in car cameras at Pembrey, which we are likely to mandate in all cars when we are confident that we have a cost and reliability with which we are comfortable. We are likely to require all cars to have an operating camera at all times, with a penalty if its not working. Given how little in-car cameras cost now, we hope that you will all agree that this is a step worth taking to raise driving standards. We are thrilled to announce that Scruffybear will be providing full coverage of the Pembrey weekend. Find him on www.scruffybear.com. We are working on the in-car cameras with Scruffy so that he can use the footage direct from the cars, to give full in-car coverage. 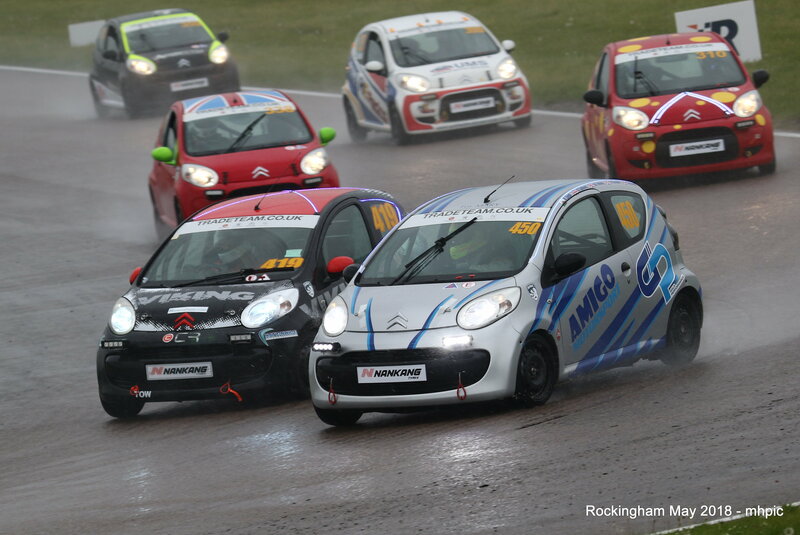 Coverage will be on the C1 Racing channel on YouTube (https://www.youtube.com/channel/UCW-ebEnSs-c0f7qJRA_-12g), BARC TV (www.barctv.net) and all the websites that covered the Rockingham 24hr weekend. Marvin Hall, our club photographer (https://www.facebook.com/mhpic/) will be there taking stills; and Peter Scherer writing it all up. 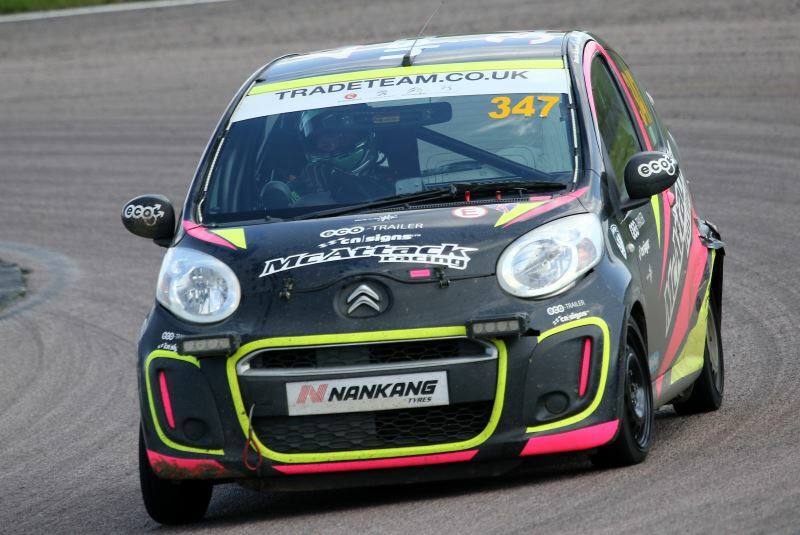 Rick, from www.smallcarsrus.co.uk will also be at Pembrey with an improved selection of spares and consumables based on what was needed at Le Rock. If there is anything specific that you’d like him to bring, please let him know. We will also have a number of everything that is available on the club shop; and will be bringing some of you recent orders along to the track with us. Well that was quite a weekend, wasn’t it? A lot of firsts – it was the Club’s first 24hr race; it was Rockingham’s first 24hr race; it was the first use of HuTags in the UK; it was many driver’s first race; it was many team’s first 24hr race; and it was our first race recorded on video throughout. The most important first, though, was that of our winners, RAW. Warmest congratulations to Robin Welsh and his team for a brilliantly-executed race with both first place and the fastest lap. Well done. Second, we want to make a big apology to the winners in the 3hr race. The timetable for the Saturday was so tight that we didn’t have enough time for a podium ceremony and make sure that everything else happened on time. We are extremely sorry that we couldn’t fit it in; and appreciate that it is an important part of the meeting. All the 3hr trophies, caps etc. were in Club HQ ready to be presented. We are planning to do the presentation at Pembrey as the 1st, 2nd and 3rd teams have all entered and should be present. We are going to work out a way in which we can manage a podium ceremony for the 3hr race at the next Rocky. Thank you to the volunteers who helped us. To Christine, Aubrey, Miranda, Ryan and Richard, to over 60 marshals, to the scrutineers, clerks and course staff, to the 20 people who volunteered to drive the safety car, all of whom gave up their weekends for no pay to make the weekend happen. We all tend to take this for granted, but having now been on the other side of the fence and seen really how hard they work, we owe a big debt of gratitude to them all. Briefing documents need to be better. We now know the list of questions that we got asked, so can deal with them in advance. Scrutineering needs to start earlier. We are going to aim for starting at 1000 or 1100 hrs on the Friday morning, so as to give a lot more time for the scrutineers to do their job to the full. We have ordered some new scales, since we had some inconsistent results from our trusty old (clearly too old) ones. We will limit the number of weighs per car, since checking six times holds everyone else up (and the winner was 16kg over weight, so it can’t be that crucial). We need to give a clearer briefing on how cars must be presented to scrutineering (full of fuel, with passport and MoT, with all drivers in kit and with drilled posts / bolts for ballast). The HuTag system needs refining. There are already more sensors on order, so that we have a larger sweet spot at the pit lane exit and at the exit of the drivers’ briefings. We need to add the drivers name to the timing screens as well; and remind everyone that we know the first driver from the nomination form, so you can just drive out onto the grid. It was the first time that we have attempted to provide TV coverage of one of our races. Look out for the highlights programme on Motorsport TV, when we know the timing, we will let you know. We think that Scruffybear and his team did an amazing job as there were over 3,000 full views of the live stream. We are preparing short and a long highlights programmes, we’ll let you know when they are ready. We’d also like your thoughts on the in-car set up – we can do that free, but we can also offer a more sophisticated wireless-based set up at a cost: Scruffybear is working that out for us. Again, please let us know your views. Two final points. Parc Fermé needs to be just that. One team was disqualified because someone, who had lent the lead to them, cut the ballast sealing tags and removed their ballast in Parc Fermé. We have every confidence that it was an innocent mistake, but BARC had no alternative. Please, even if Parc Fermé is a little less Fermé than usual, respect the conditions and do not touch the cars. Only a few days to go now until Rocky, so we thought that a round up on admin and where to find things would be a good idea. There will be further videos and articles on the race in Car Magazine and on their website; and on Motors1 website; and potentially a short program on the race on the main MotorsTV channel: we’ll post more details on that as soon as we have them. Scruffybear Productions have been hard at work this week putting the cables in place and installing the rest of the equipment for the coverage. The drone will be up throughout the race; and we have cameras covering the pit lane and roving the track, as well as a number of static cameras. You should expect to have a camera lens pointing at you regularly; and the commentators putting a microphone in front of you just as you fall exhausted out of your car at the end of a stint; especially at night, when the track action is less effective. There will be in car cameras in a number of cars which we thought might be particularly entertaining. The vouchers can be redeemed against Citroen & Eurorepar parts including lubricants and Trade Team merchandise (including Jackets fleeces etc.) purchased from Trade Team Robins and Day parts in West London. As the saying goes, terms and conditions apply and will be printed on the vouchers. Paddock access will require a pass for vehicles from Friday morning until Sunday evening; and these have now been sent out to teams. The paddock is going to be very busy, so the Club will be removing any vehicles that have not got a pass clearly displayed. 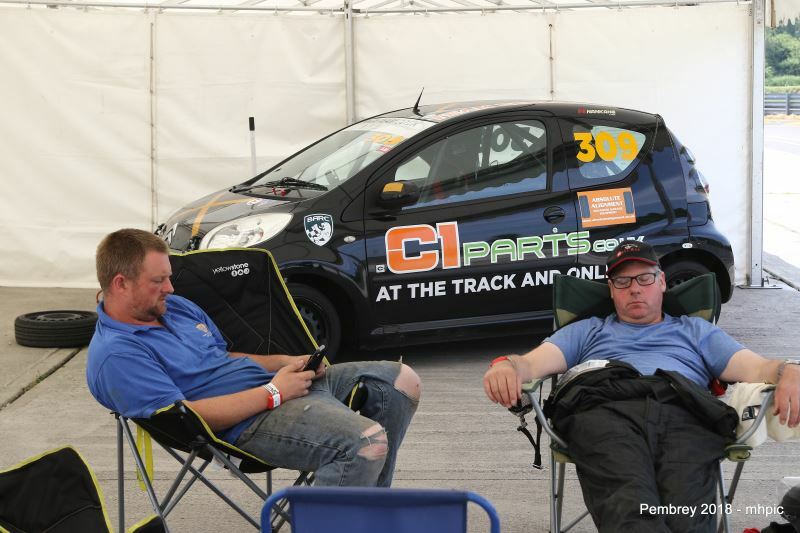 Motorhomes should be parked at the back of the paddock, away from the garages: happily the C1 is quiet enough that the noise won’t keep you awake, but its safer back there; and we need all the space we can near the garages for the race cars, pit crew and equipment. The end of the paddock near Club HQ will be the area where you will find the trade stands, pop-up Citroen dealership; and one of the food areas. Again, please don’t park there, we’ll just move your vehicle to somewhere you won’t be able to find it. Thank you to all those who have volunteered to drive the safety car. We have ended up with 20 people in the safety car over the weekend; the rota has now been published. Hopefully, there won’t be too much for them to do, but its been a big help to BARC for the weekend and a great way of getting more people involved in the race and on the circuit. The supplementary regulations have been published for the weekend. Probably the most important is the 30 kph speed limit in the pit lane. This is deliberately low, so that we are able to use the pit lane next to the garages, rather than the remote (hot) pit lane. Its narrow; we will be using the Club’s speed gun all weekend; and there are suitably draconian penalties for those who break the limit. None of us want to see any one hurt; and if BARC do not feel comfortable with how we have behaved, we may end up not being able to use the nearer pit lane in the second Rockingham 24hr. The Club breathalyzer will be in action at signing on and throughout the weekend; and we will be applying our usual zero tolerance approach to alcohol consumption for those driving, or running a team, in both races. At the test day in April, one person was caught and was not allowed to drive, so don’t spoil yours or anyone else’s weekend. Driving standards are also very close to our heart. All four directors have completed the Driving Standards Observers course, which the MSA kindly ran for us. We are all recorded as DSOs and Judges of Fact for the weekend. This is a low-cost endurance series; and accident damage materially hikes costs. In a 24-hour weekend, whatever Senna said, all you can do by “going for a gap”, or trying to win on the first corner, is lose the race, and ruin someone else’s (including all your team mates). We will be out there watching; and we have TV coverage recording the entire race, so please remember that motor racing is a non-contact sport. Unrelated to the 24hr, we are planning on a limited run of our rather dashing embroidered Club polo shirts. If you’re interested, let us know. We will put them up on the website after the 24hr, so that we can collect orders, colours and sizes and have them made up. Lastly, we look forward to seeing you all there. We will be arriving on Thursday evening and setting up camp. Our mobile numbers will be on the wall in the Club HQ if you need us, but Club HQ will be manned throughout the 24hr. We can’t wait. 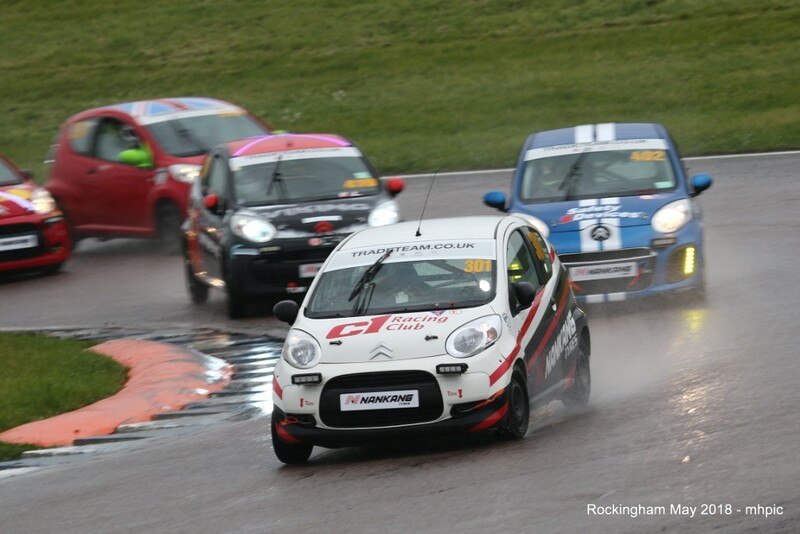 The first race of the season is nearly upon us, and it certainly feels like that at C1 Towers, where we are working feverishly to get everything ready for a great weekend at Rockingham. This newsletter will focus mostly on the upcoming 24hr and 3hr races. See the promo video above and also available on our website, facebook and youtube. Citroen UK have provided us with a safety car; and in order to involve as many people as possible, we are asking for up to eight volunteers to drive the safety car for two-hour stints. Neither previous experience, nor a race licence is needed; all you would have to do is follow the instructions of the marshalls in the car with you. As usual, it’s going to be first-come, first-served. Please email meyrick@c1racing.club to volunteer. https://barc.blob.core.windows.net/barcnet/2018-hq08-rk-v1-e9ni8.pdf . We will not have access to the paddock until 1900hrs on Thursday night; and need to clear the paddock completely by 1000hrs Monday morning. Rockingham has very kindly agreed to open the Diner on Monday morning so you can have a bacon buttie to speed you on your way. We are going to add a group photograph of all the C1 Race Cars at the weekend. This will take place immediately after the warm up for the 24hr race on the Saturday morning: please would the 3hr cars line up in the hot pitlane during the 24hr warm up; we will then guide all the 24hr cars to join them, rather than going back to the pits; and hopefully it will be as bright and sunny as on the test day for the photographs. We will take pictures with and without drivers, so we would be grateful if all drivers (both 3hr and 24hr) could be in their race suits with their helmets for the photo shoot. We will aim to clear all the cars from the hot pitlane by 1120hrs, so that it is clear again for the Pickup race, which starts at 1135hrs. The paddock will be extremely busy for the weekend, not only with competitors cars, but also with the food arena and trade stands including: Citroen UK, TradeTeam and Evans Halshaw, the local Citroen dealer; Safety Devices; Nankang; SmallcarsRUs (who will bring a cornucopia of spares including engines, gearboxes, front headlights, rear lights, bonnets, wings, front and rear bumpers, door glass, doors, tailgates, starters, alternators, exhausts, cats, wheels and various nuts and bolts); and hopefully Demon Tweaks all coming for the weekend. If there is enough interest, we can also organize tyre changing facilities. Please email meyrick@c1racing.club if you would like tyre changing and let him know how many tyres you expect to need mounting / changing by Sunday 29th April. Club headquarters will be in garages 35 and 36 for the entire weekend, which is where breathalysing and signing-on will be; and where all drivers will need to collect their Hutags (£10 deposit each), which they will need to wear all weekend, and teams will need to collect their pitlane bibs (£40 deposit). The Clerk of the Course will be in Race Control, which is located on Level 2, Stairwell 6; which can be accessed from the paddock via the tunnel next to garage 36, there is a lift next to the Diner; although we hope none of you will be summoned to visit. There will be two drivers briefings, which will take in the Rockingham Welcome Centre at 0900hrs on Saturday morning. The first part will be for all drivers and team managers in both the 3hr and 24hr races; the second will be for those drivers that are starting both the 3hr and 24hr races and will follow immediately after the first briefing. Entrance to and exit from the briefings will be recorded by means of the Hutags, so there will be no getting out of attending the briefings. If a team manager does not attend, the team’s drivers will not be allowed on circuit; if a driver does not attend, they will not be allowed on circuit. We will only be using the small pit lane directly in front of the garages for the whole weekend, there will be a pit lane speed limit of 30 kmh, which corresponds to a little under 4,000rpm in first gear, and will be rigorously enforced with the Club’s radar gun. First transgression will result in a one-lap penalty; second, five laps; a third immediate disqualification. All team members on the pit wall will have to wear a C1 Racing high visibility bib at all times, four of which will be available for each car. No pit wall shelters will be allowed, as it would hinder the visibility of teams further down the pit lane; nor may any pit boards be attached to the pit wall. LED pit boards are not allowed. Finally, the 3hr teams will not have a pit allocation, unless their team is also running cars in the 24hr race. They will be based in the outer paddock, along with the Pickup truck teams; and will only be able to bring fuel, tyres and a working tool box to the pit lane. We suggest that the remaining 3hr teams pair up with a 24hr team, to be located in front of their garage. We would be very grateful if those 24hr teams would help out those 3hr teams with tools and by providing some space if possible. Finally, please make sure that you have read the SSRs for the 24hr race, which will be published on the BARC website shortly, and any other bulletins that come out. All the Club directors have been published as DSOs and Judges of Fact for the event; and you will see us, especially at the first corner, sporting our identifying DSO bibs. We will be arriving on the Thursday night and will be staying at Rockingham for the whole weekend, so please come and join us for a drink the night before – although bear in mind that the club breathalyzer will be in action again for drivers and team managers throughout the weekend. See you then. Thank you all who made the Test Day at Rockingham such a success, although the glorious weather certainly didn’t hurt. We saw 57 cars out on circuit (which collectively made less noise than the single rather marvelous Aston Martin GT3 that was running in the other session); pretty good driving standards overall with only one material incident all day; and virtually all cars running in the final happy hour of open pit lane. The new club breathalyser was in action at signing on, which will be a consistent theme of the season. One person failed the breath test and was not allowed to sign on or drive; everyone else sailed through with a zero-alcohol reading. Hopefully, with Caryl having processed a lot of membership issues and handed out a lot of membership cards, the signing on process will be quicker as the season progresses. Anybody that couldn’t collect their membership card will have it sent in the post by the 27th April. At lunchtime, Marvin Hall managed to get some great photographs when we managed to get virtually all the cars at the circuit lined up three abreast in the hot pit lane for a group photo. We’ve already posted one, but if you’ve got any good photos of the group shot, please add them. We thought that they all looked great together. We will be trying to repeat the exercise at the 24hr weekend when there should be 91 cars there! Philip and Meyrick spent a lot of the day hard at work in the scrutineering bay helping teams weigh their cars, so as to be able to get the ballast right; and check the cars over for eligibility, so that we won’t have any surprises at the 24hr weekend. Looks like we have a bit of work to do on the club ramps, which weren’t man enough for the job; although its nothing that a little wooden reinforcement won’t cure. Scruffybear Pictures were also at Rockingham the whole day to plan camera locations and their other logistics; and to take some footage with their drone and roving cameras in order to make a short promotional clip for Motors TV. That should be out during next week. We are also able to offer customized edits of the footage for your team, in addition to the TV feed; so if you would like to have a full HD program concentrating on your car, please let us know and we can work out pricing for you. It would probably mean that you would get a live in-car camera in your car as well. TSL joined us as well; and you may have seen them trialing the new driver transponder system at the end of the pit lane. That trial went very well; and the system will be used at all our races this season. This removes the need for the team to fill in any driver forms and materially reduces the administrative burden on teams. The Touring Car boys were out in force today, including their leader, Alan Gow in his track return; but we also had Rob Austin, Josh Cook and Anthony Reid out on circuit. 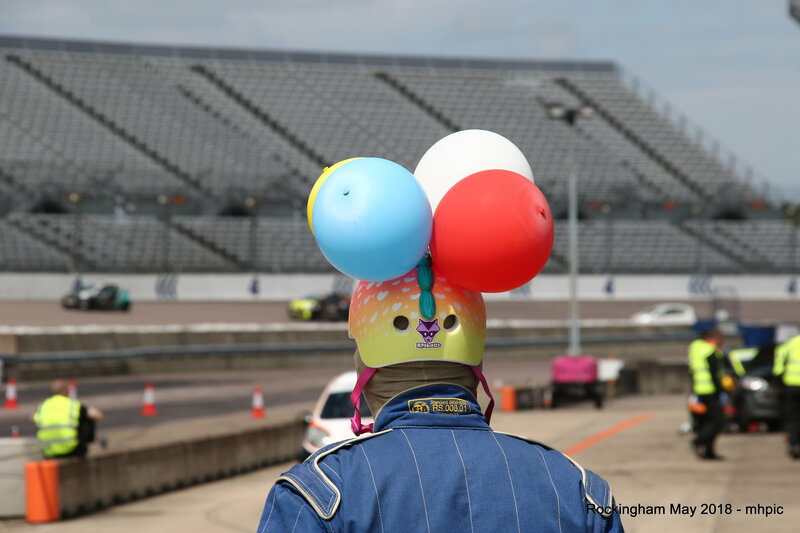 The team from Rockingham Circuit was also out in their mostly liveried car, although we didn’t manage to coax Peter Hardman into the car – guess he already knows where the circuit goes. We also had Vicky Parrott from MotorsTV, Mark Walton from Car Magazine, Adrian Mossop’s and Ian Sedgwick’s Citroen UK teams testing with us. Rumour has it that none of the Touring Car drivers set the fastest time of the day, which was a 1.52. We hope that you all enjoyed the hog roast – it all disappeared, so that is probably an answer in itself! Looking forward to the 24hr and 3hr races on the weekend of 11-13th, which is going to be even busier, with double the number of cars and teams present. Paddock space is going to be at a premium, and we will need to restrict the number of cars that each team keeps in the paddock during the race, so that there is enough space behind the pits for those that are really necessary. Non-essential cars will have plenty of secure parking in the outer paddock. The practice day on the Friday will follow much the same routine as you saw at today’s test day. Signing on will be a long and time-consuming process if you have not fully completed your entry forms before you arrive. Entry forms for both the 3hr and 24hr races are available online. They will remain open until midnight on 29th April after which time no changes will be possible. So make sure that your club membership is valid and all driver details are correct in the next few days. If you need to renew your club membership, you will have been sent an email. Please follow the link in the email to renew the membership – it can’t be done by adding your credit card details into the ‘My Details’ form. We will also be issuing all drivers with a Hutag for a £10 deposit, which you will need to wear all weekend; and then return at the end of the weekend. All drivers, pit wall crew and team managers will be breathalysed each day; with further spot checks during each day. Scrutineering. Please remember that you need to come with a full fuel tank, so that we can see fuel in the filler spout. This is because when you are weighed, we can then deduct 28.5kg of fuel from the total, so that you can ballast the car to 910kg with the lightest driver. If the tank is half (or whatever) full, we cannot do so. We will then lock wire and seal the ballast in place, and that seal has to remain in place for the whole weekend. We will also be fitting OBD reader / recorders to cars throughout the weekend, so that we can download and check your car’s engine, electronic and ECU behaviour. We have 10 of these rather trick little devices and will be fitting them at the end of the pit lane; and removing them at the beginning of the pit lane, so as to prevent any tampering. The pit lane will not operate as it did on the test day. The entire hot pit lane (ie the wider section that is further from the garages) will be closed throughout both races; and we will only be using the cold pit lane nearest to the garages. All the cut-throughs will be closed and a 30 kph speed limit will apply to the entire cold pit lane. The Club has a radar gun, which will be in operation throughout the race: get caught speeding, and you will lose a lap. The pit wall will remain as it was for the test day.